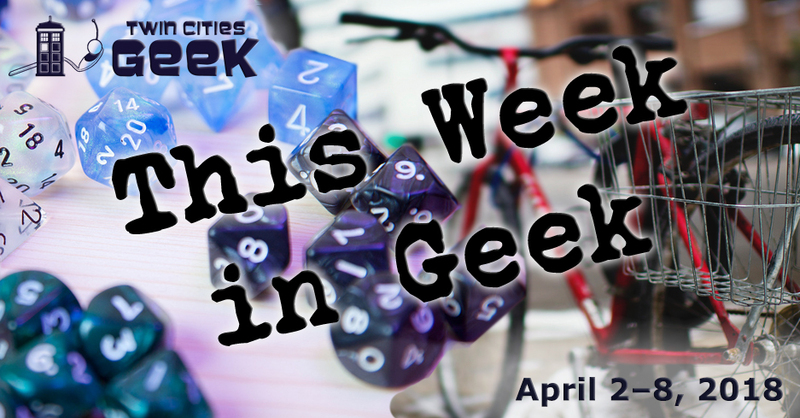 Welcome to This Week in Geek, your guide to events of interest to the Minnesota geek community for the week of Monday, April 2nd to Sunday, April 8th. When: Monday, April 2nd at 6:30 p.m. When: Monday, April 2nd at 7:00 p.m.
Dungeons & Dragons! Tales of adventure and terror told over flagons of craft beer with possibly rabbit-inspired demons. All are welcome to this open-table game held at Eastlake Craft Brewery. System knowledge and experience is not required, just a willingness to show up and “come ride the fantasy train.” Space in the brewery is limited, so show up early if you want to guarantee a seat. When: Tuesday, April 3rd at 6:15 p.m.
Books & Bars is an “open public book club show” hosted and moderated by Minnesota Public Radio senior producer Jeff Kamin that provides attendees with “a unique atmosphere for a lively discussion of interesting authors, fun people, good food, and social lubrication.” The book being read and discussed this month is Beartown, a tale of ice hockey, hope, and encroaching failure, by Fredrik Backman (bestselling writer of A Man Named Ove). When: Tuesday, April 3rd at 7:00 p.m.
Come and experience YogaQuest, a blend of yoga and fanfiction storytelling led by certified yoga instructors. Experience a yoga workout experience and a story at the same time. This week’s theme is Harry Potter, so track down YogaQuest on your Marauder’s Map! This event costs $15. Enjoy a night of community and tea with Tea and Meeples, a weekly gathering of friendly geeks at Panda Castle in Richfield. Rock is on the agenda for this week, with the game Rock Band allowing folks to rock out in a friendly setting. Dinner will be a strawberry fields salad. When: Tuesday, April 3rd and Wednesday April 4th at 7:30 p.m. Legendary geek-comedy musician “Weird Al” Yankovic will be performing for two nights at the Pantages Theatre in Minneapolis as part of his “Ill Advised Vanity Tour.” Comedian Emo Phillips will be joining Yankovic for this tour, so expect a night of hilarity, geek references, and alt-comedy goodness. Tickets are $70. When: Wednesday, April 4th at 6:00 p.m.
Do you have what it takes for the Magic: the Gathering Masters 25 Draft? This event will be paying tribute to the 25-year history of the game, running from Alpha to the more recent Rivals of Ixalan. Draft a competitive 40-card deck from three boosters and compete in three matches for glory and a chance at prizes (one pack per win, with extras from Clockwerks). Entry is $35 for this event, and every level of player is welcome here, from those with 25 years of experience to complete newbies. When: Wednesday, April 4th at 7:00 p.m.
GeekOut Minnesota returns with a night of exploring virtual worlds and connecting with other geeks in the real world. This is a great opportunity to explore virtual reality with an HTC Vive, with a number of available titles. So, disappear into exciting virtual worlds and talk geeky with fellow Minnesotans. When: Wednesay, April 4th at 7:00 p.m. If you happen to be the type of person to remember the Slutty Pumpkin, what Minnesota city Marshall was from, or the pineapple incident, then shout out “Challenge Accepted!” to How I Met Your Mother trivia at BlackStack Brewing. Bring some friends and have a great time answering trivia from the series. Costumes welcome! When: Thursday, April 5th at 5:00 p.m. When: Thursday, April 5th at 6:30 p.m. The Barony of Nordskogen (Minneapolis chapter of the Society of Creative Anachronism) is partnering with the Geek Partnership Society for medieval-court-dance practice. Participants are encouraged to dress up if they like. This event is free, and is a great opportunity to learn, get moving, and meet new folks. When: Thursday, April 5th at 7:00 p.m.
First Thursday Films at the Capri Theater—a screening and speaking series—will be showing Quest as part of Black Cinema: Under the Skin, a program of films by black filmmakers exploring black culture and experience. Quest is a portrait of the Rainey family in Philadelphia and follows 10 years of their lives, from the beginning of the Obama administration to the present. This is a story of raising a family while also nurturing a creative space, and the challenges that accompany it. Tickets are $5. When: Thursday, April 5th at 8:00 p.m. This regular event at Clockwerks Brewing—hosted by Sam Spadino and Sidney Oxborough—represents the convergence of two geeky favorites: a steampunk-themed bar and absurd trivia. Trivia Against Humanity has also expanded and now has weekly events at Mortimer’s and Glam Doll on Tuesdays and Modist Brewing Company on Wednesdays. When: Friday, April 6th at 9:00 a.m. to Sunday, April 8th at 7:00 p.m.
Anime Detour is a three-day anime convention in the heart of downtown Minneapolis with a variety of events including panels, cosplay, parties, gaming, music, artists, and more. This convention is kid friendly, and should have something for everyone, including a variety of guests like F. Wesley Schneider (co-creator of Pathfinder and speaker on topics of inclusivity), Brianna Lawrence and Jessica Walsh (cosplay heroes), and more. Preregistration is closed, but there will be registration at the door for $75. When: Friday, April 6th at 6:00 p.m. When: Friday, April 6th at 6:00 p.m. to 9:00 p.m. Die Laughing, a 50-hour comedy marathon to raise funds for Fearless Comedy Productions, returns for its fifth year. Expect 50 hours of comedy including stand-up, improvisation, jugglers, and more. The comedy events in the marathon range from kid friendly to raunchy, and the website includes a filter for event type and kid friendliness. Where: Saturday, April 7th at 10:00 a.m. This all-day gaming event is your opportunity to play Magic: the Gathering while helping a good cause. There will be three events throughout the day, with a 10:00 a.m. Masters 25 2HG, a 2:00 p.m. 25 Sealed, and a 6:00 p.m. Masters 25 draft. Entry is $35 for these events, with proceeds from tickets, raffles, and other purchases going to World Central Kitchen, a non-profit helping out our fellow citizens in need in Puerto Rico. When: Saturday, April 7th at 10:00 a.m. The Geek Partnership Society’s United Geeks of Gaming group offers its open-gaming session on the first Saturday of every month, to which gamers of all ages and abilities are invited to “spend the day hanging out with fellow geeks playing, learning, and teaching games.” Attendees are encouraged to bring their favorite board games, card games, and/or role-playing games, but the group has amassed an impressive library of its own games as well. When: Saturday, April 7th at 2:00 p.m. The dream of the ’90s will be alive in Minneapolis on Saturday, April 7th during the ’90s Bar Crawl. This event is all about reliving the glory days of the Clinton administration, the Fresh Prince, Frasier, Ninja Turtles, and more! Participants will get a signature bar-crawl cup, a welcome drink, drink specials, ’90s music, and more at Brother’s Bar and Grill, The Depot Tavern, Gay 90’s, Gluek’s Restaurant & Bar, Last Call Bar & Grill, and The Pourhouse. Tickets are $20. When: Saturday, April 7th at 8:00 p.m.
Support the Haunted Basement with a night of spooky fun at Squirrel Haus for the “anti-gala,” an event bathed in black light, with entertainers, tarot reading, day-glo face painting, snacks, refreshments, and more. Guests will have first dibs on 2018 Haunted Basement tickets. General admission is $15, with VIP tickets (including an exclusive performance from Transvestite Soup) for $40. When: Sunday, April 8th at 10:00 a.m. This mixed-level belly dance class incorporates a variety of dance styles, including Tribal Fusion, Greek, American-Egyptian, and world fusion, and is taught by Shannon (who readers might know from Geek Slink Belly Dance). These weekly classes will help build a strong core and set of skills. This class is intended for all bodies, all ages, all sizes, and are built on a platform of acceptance and inclusivity. Classes are $15. When: Sunday, April 8th at 11:00 a.m. The United Geeks of Gaming group invite you to RPG Sunday Game Day! Whether you are an experienced game master wanting to run a game, or someone entirely new to the world of role-playing games who wants to join a game and learn as you go, this is the Sunday game day for you. When: Sunday, April 8th at 12:00 p.m. When: Sunday, April 8th at 12:30 p.m. Gender Jam—a meetup group for trans, gender-nonconforming, questioning, and intersex youth—will be meeting up for an afternoon of community and fun. This week, Gender Jam will be hosting an afternoon of Netflix and sleepover fun, so bring pajamas, a sleeping bag, and get cozy. As always, bring your permission slip if you are under 18.